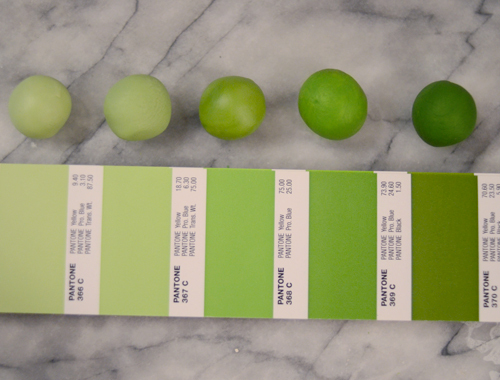 I work with Pantone swatches on a daily basis. They are integral to graphic designers, printers and interior decorators alike. Yet how could it be that I have no use them in the kitchen! 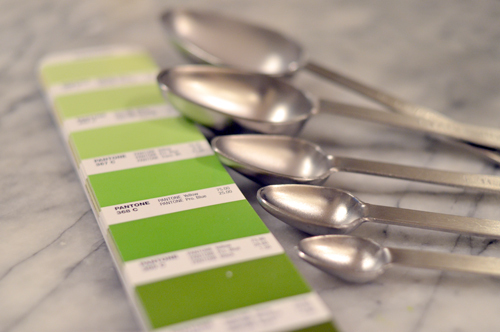 In an effort to try and bring my two worlds a little closer, a brainstorm ensued for ways to incorporate my love of Pantone into the kitchen. 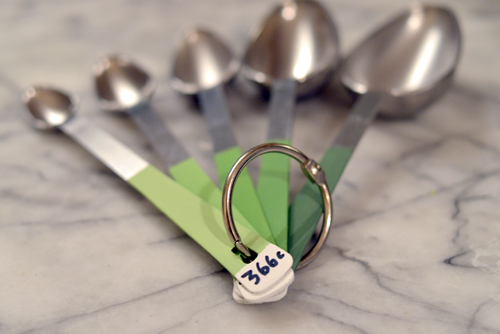 It seems to me that the closest equivalent to a tool such as a Pantone swatch book in the kitchen would be measuring spoons, so I decided to give my spoons a color makeover. 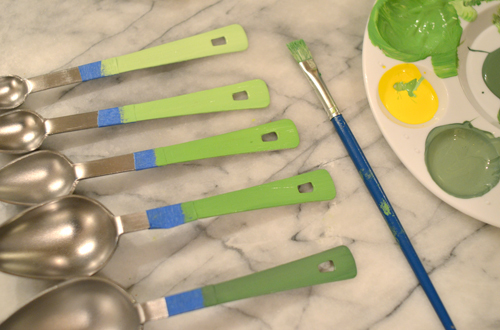 I decided to go with a cheery green palette for my measuring spoons. 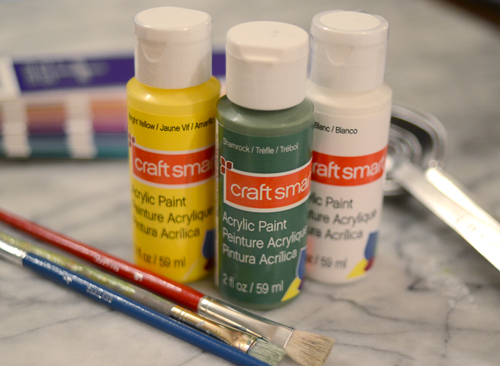 To re-create the Pantone colors, I had to mix acrylic paints in green, white and black. 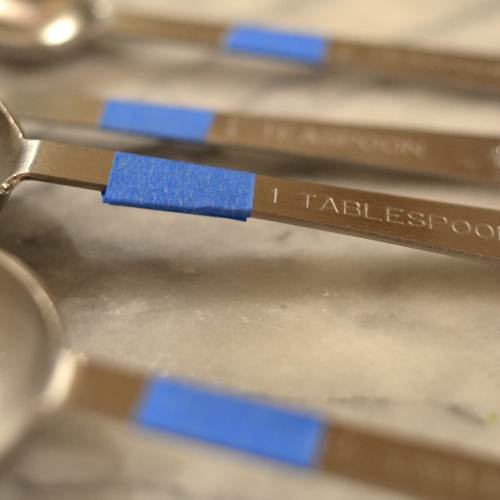 Painters tape helps keep clean lines and prevents the paint from getting near the spoons. 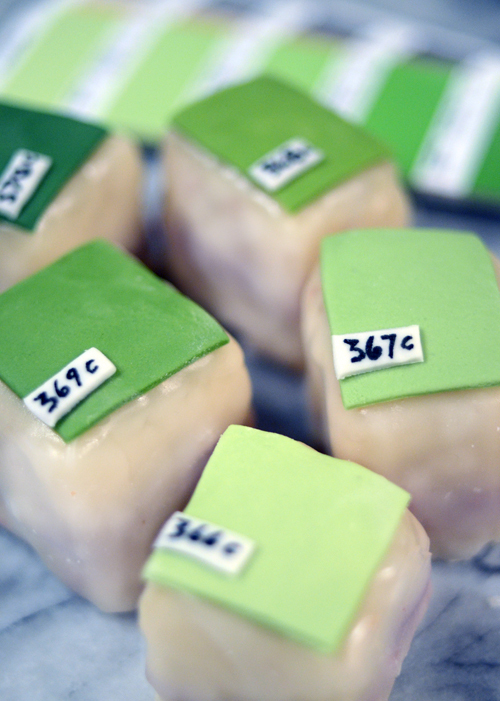 Petit fours were the perfect excuse for me to bring Pantone colors into baking. For mine, I baked a simple yellow cake, trimmed the edges and sliced it into two layers. 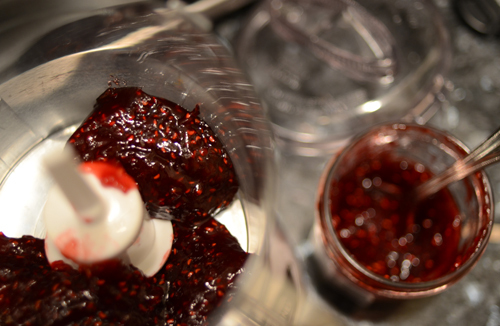 Then I pureed some raspberry preserves and spread it in between the layers of cake. 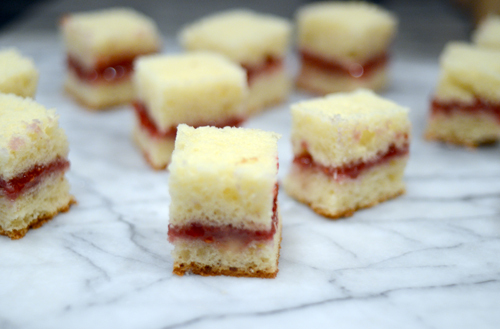 Finally, I cut the cake into one inch squares and chilled them for a few hours to make them firm enough to coat. Now, it's time to decorate these suckers. 1. 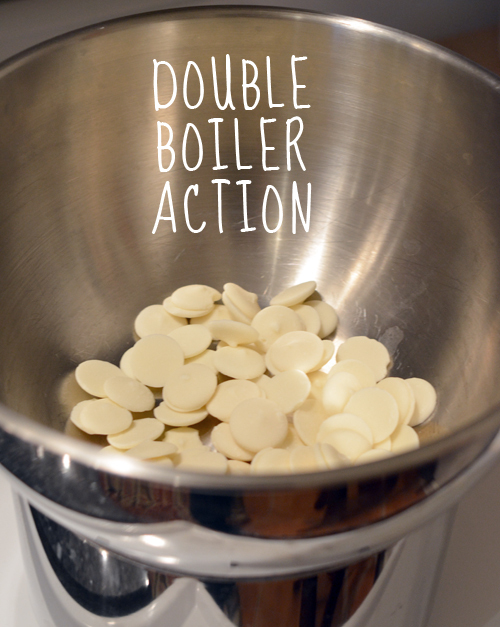 Place the white chocolate in a heat proof bowl over a pot of simmering water and stir until evenly melted. 2. 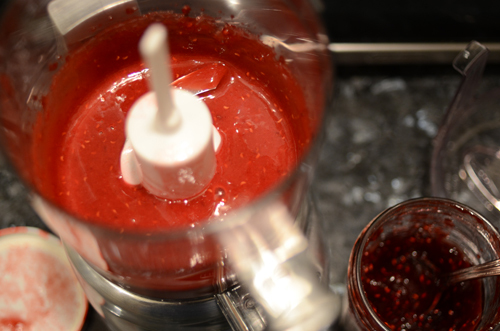 In another bowl, mix the confectioners' sugar, light corn syrup, hot water and vanilla. 3. 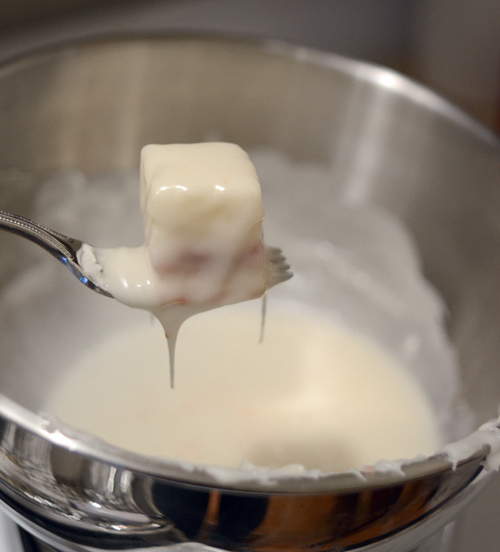 Stir in sugar mixture to the melted white chocolate and mix until smooth and icing easily pours off the spatula. 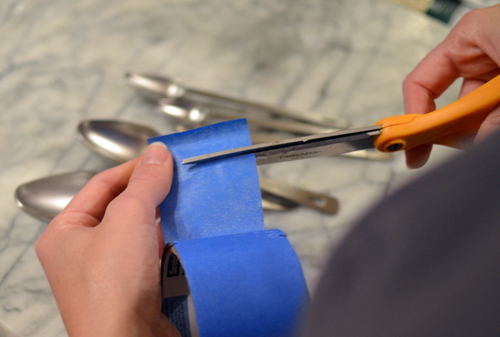 Turn down the heat to the lowest setting to keep icing warm. 4. 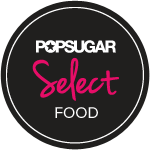 Place a petit four on a fork and, holding it over the bowl, use a spoon to gently pour icing over the cake. 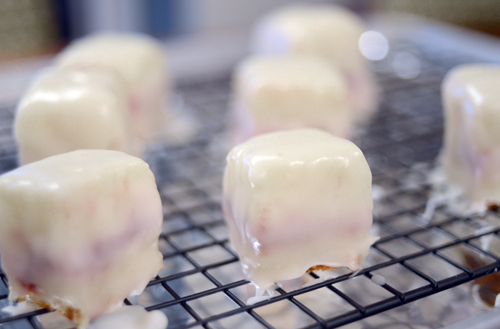 Once it's coated, place the petit four on a wire rack to set. It's best to have a lined baking sheet under the rack to catch the extra icing that drips of the cake. 5. Decorate any way you like! I recommend piping tinted icing or adding some bling with dragees. 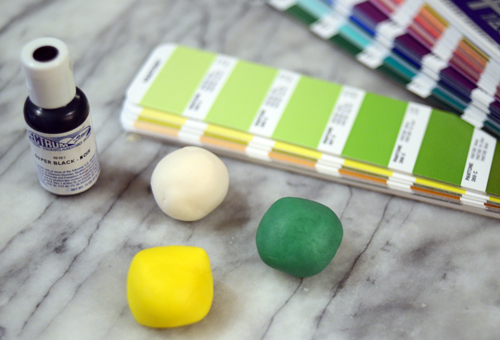 I colored rolled fondant to achieve the Pantone green I wanted. Once the color was perfectly tinted, I rolled the fondant out very thin, cut a square and used a little water to adhere it to the petit fours. 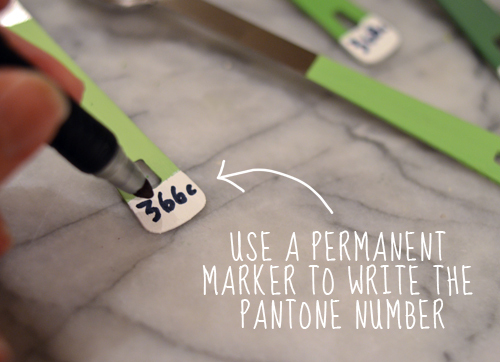 The final step was to number the petit four "swatches" with an edible ink black marker. 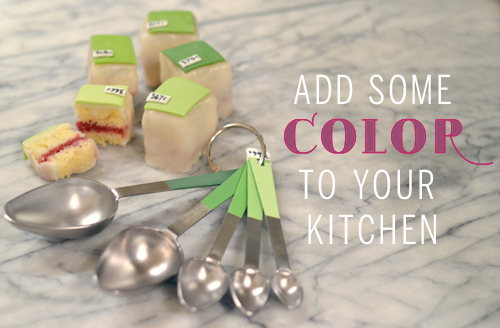 So maybe it is a stretch to try and unite a couple of my favorite things, but even if Pantone doesn't really have a place in the kitchen, at least it inspired some colorful treats! Very fun, and I love the green! Wow! that's a lot of work. Very impressive. You should have spread all that hard work over at least 2 posts.